A thing of beauty hangs in our hallway tonight. No, not Nigel – he’s beautiful in his own way. And he’s not hanging from anything. A labor of love adorns the wall just next to the door of the dog room, and I can’t believe I’m viewing it in person. When a parcel hold notice from the postal service was left on the door Friday I thought nothing of it. There has been a steady supply of packages arriving here over the past month after all: dog books, treats, collars – all of them for review. I’ve grown accustomed to receiving unexpected items, so another notice from the USPS is not something that would normally get my attention. This time, I happened to notice who the sender was. Dim as I may be, a faint light bulb managed to illuminate the dark recesses of my noggin. I contained my excitement in order to avoid tipping my hat to Mrs. Author. We left the house Saturday morning to run errands, one of which was getting a package shipped out to a recent Life With Dogs contest winner. Perfect timing. I managed to sneak this new arrival in to the trunk of the car undetected. The rest of the day was spent hiding my desire to run back to the car and rip the box open while we completed such exciting tasks as dropping off movie rentals, gassing up the car, and the always enjoyable trip to the grocery store. You’d think Mrs. Author would have caught on when she noticed that we were rocketing home from the grocery store at eighty-five miles per hour. Considering that the trip takes about fifteen minutes at legal speeds, you would have thought I had a trunk full of lobsters to haul a hundred miles on a ninety degree day by the blur of our silver sedan snaking through the mountains at breakneck speed. I heeded her request to let off the gas a little. I was like a kid on Christmas morning. Once the dogs had greeted us and the car was unloaded, I smiled and put the box on the table. The shape gave it away. Between the two of us, I think it may have taken twenty seconds to unwrap the package and find our way to something we have both been admiring nonstop for days. Were we blown away? Beyond description. Kathleen Coy was so sweet and selfless to offer to paint our boy, and to sell the painting online in order to raise funds for A Place to Bark. We had contacted her in order to be certain that we could acquire a print. She’d assured us that prints would be available after the auction, so we watched eBay with baited breath. When the auction closed I contacted her again and was told that we could work out print arrangements after the approaching holiday weekend. I thought nothing more of it until that little yellow note found its way into my hands Friday. How did this wonderful, beautifully crafted work of art find its way to us? That’s the other truly touching part of this story. Enclosed in the package was a letter, one that we’ll never forget. More than twenty people had formulated a plan to win the auction and send the painting to us. For now I’ve maintained their privacy (I’ve not had time to contact all for their permission to disclose their identities) but we cannot thank them enough. It was a gesture of kindness and generosity that we’ll never forget. Every time I pass that painting I grin – and not just because these wonderful people went out of their way to do this for us. It is what I learned after we had hung the painting that nearly reduced me to tears. The Friends of Buggers Society (can you imagine what that secret decoder ring looks like?) had pooled their resources to buy the painting. Once the auction ended there was a pile of money left over, and rather than reclaim unspent dollars, the group decided to donate the remaining money (another two hundred dollars) to A Place to Bark in our names. It’s impossible to convey our heartfelt thanks adequately. In time, all will come to know how grateful we are as we find our way to each of them to offer our gratitude. Of course, we are thrilled to have this work in our home. Kathleen did such a good job that I can see no deviation from the picture I provided as the basis for the painting. It’s simply perfect. As much as it will thrill me to see this every day, it is the story behind the painting that will stay with me each time I pass it. These great people, their generosity, and the animals who benefited from this collective act of kindness stare back at me from a square of wood, stretched canvas and oil that will never leave this home. Our hearts are warmed by each brush stroke, every gesture made by those involved, and today we may say with certainty that we know who our friends are. BowWowzer! That’s soooo touching. People can be as nice as dogs sometimes. You deserved that special kindness. Nigel rocks!! It’s such an amazing painting 🙂 Lucky you! How wonderful! Really makes the holidays feel even more special. What a heartwarming story about the gift of friendship! The painting is beautiful and the colors are perfect for Nigel. Kathleen did a fabulous job! And thanks to your post, I now have another blog to follow – Kathleen’s. You have given so much of your time and energy to the dog lover community. And if anyone has a bad day, they can be sure to find something right here to life their spirits. You deserved that painting. It sounds like it was intended for you all along. Blessings to you, Have a lovely Thanksgiving. What a touching story – the painting is definitely with its rightful owner! And still so many benefited from it – dog lovers are the best! It is the most beautiful painting and the story behind it just as lovely. Oh this is so wonderful!!!! Beautiful painting for a wonderful cause and you get to see it every single day!!! Wow, that is so awesome! Very beautiful! She did such an awesome job. What a great story, especially here at Thanksgiving! A truly loving group!! love “friends of buggers society”. i hope by making a big fuss of the skinny dog, you’re not making fudge pants feel bad about … girth. nothing tastes as good as buggers feels. It truly is a beautiful painting, but as you say, how it came to you is really the beautiful story. 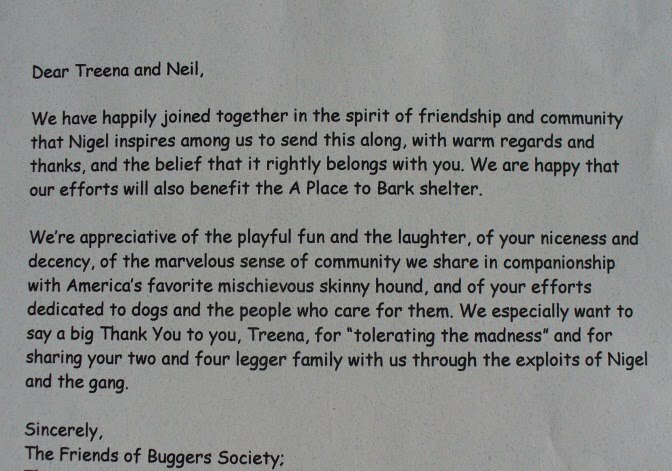 We are so happy this group was able to do it for you AND for the rescue’s benefit too. Enjoy! Beautiful portrait and wonderful story behind it! What a blessing to have received that and to have such wonderful friends. Kathleen is a special lady with a wonderful and amazing talent. I love the painting and the story warms my heart. Thank you for sharing that and you are most deserving of the treasure. God bless you and Happy Thanksgiving. We love the painting and the wonderful story behind the gift. What a greyt painting with a heartwarming story. With his portrait hanging on the wall, has Nigel’s head gotten any bigger? Its a small gesture compared with the loving friendship you have been so generous in giving all of us. Sloppy wet kisses for ya! As one who has loved a greyhound more than life itself, I can only imagine the gamut of emotions you felt upon opening that package! This is a heartwarming story and wonderful outcome for all involved. Wishing you many thanksgiving blessings. 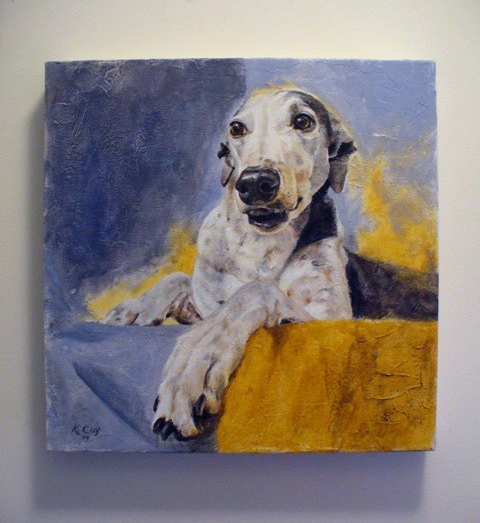 The beautiful painting of Nigel by Kathleen has drawn more attention to A Place to Bark – thank you for your generosity. May they enjoy an early Christmas, and a better Christmas, because of this. I’m truly touched at the generosity of dog people everywhere. A very Happy Thanksgiving to all of you, from our gang here in KS, and our wish for this holiday season is that every dog could find their happy, warm forever home like yours and mine have. This would rock my world and make everything right, if only it could be. A greyt story….a greyt painting…..greyt people involved. It doesn’t get any better. Happy Thanksgiving to you all. the western SC gang minus Sophia, our angel. Thank you for sharing this incredible story of love between people and animals. There is no better place to be than in the Bugger Society and sharing Life with Dogs! 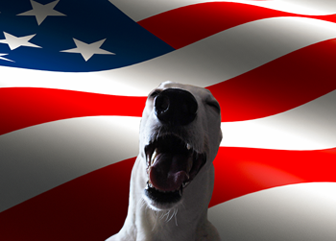 Happy early Thanksgiving and blessings to all the animals at A Place to Bark! 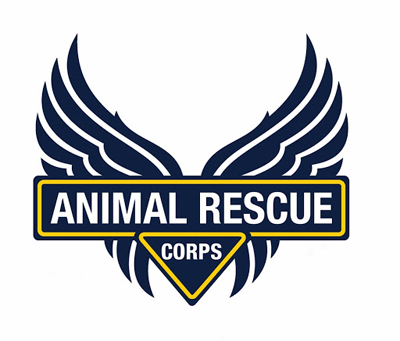 It is one of my favorite animals rescues! uh oh! The tears are threatening to drop into my coffee cup. The generous hearts of dog lovers never fails to amaze me. Wonderful, caring, giving. The picture of Nigel is just FANTASTIC. It will truly provide you and Mrs. Author with a lifetime of smiles. Happy Thanksgiving! What a spectacular story to start the Thanksgiving week with. The FOBS did well. What an inspiring story, and a beautiful portrait! That’s wonderful. So much kindness from all different angles. I guess this means I won’t be pickin’ that up for a quarter at your yard sale next year. DOGGONIT! Oh well-it really does belong with the inspirin’ folks who earned it. I’d say that the painting is where it belongs! I’m thrilled for you that you got such a wonderful, generous gift! You certainly deserve it! Now. there’s a REAL thanksgiving story!!! AWESOME!! What a marvellous story – Kathleen’s work is wonderful! Your story brought tears to my human’s eyes! Such a heartwarming post on the kindness and love that humans can show not only toward animals but also toward one another. It makes us happy that the original painting ended up with you! 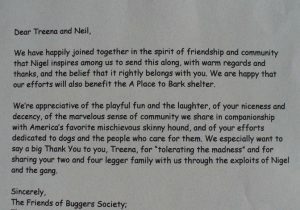 A Place To Bark is also very lucky to have The Friends of Buggers Society make such a generous donation. What an amazing group of humans! A great way to start the week of Thanksgiving! Like I said in the note Neil, I’m thrilled that the painting gets to live with the people who will love and appreciate it more than any other. It was a joy to paint Nigel, and the generosity of his fans is heartwarming. I’m so happy the way it all worked out. It was an honor to share this experience with you all.